When was the last time someone caught you off guard with a piece of feedback or a message that felt like an attack? How did you respond? If it took you by surprise, chances are for a moment you may have lost your balance, moving either away from the bearer of the message, or toward him or her (literally or figuratively). If you leaned away, in an effort to avoid conflict or to crawl inside your comfort zone, you may have withheld your point of view or any response for that matter. If you leaned forward, you may have thrust your point of view upon the other in a way that was more like a counter attack than a response. Or perhaps you accommodated and sacrificed your own needs in order to maintain harmony. Either way, you fell away from your center – your true place of power. What does this mean? If I am too attached to my own point of view, I am likely to force it on others and become rigid to anything that doesn’t seem to fit with it. When I am stiff and lean too far forward, I am easily knocked over. On the other hand, if I forget what I know and allow others to dictate what I believe, I will lose my footing and become easily manipulated. But if I can get to a place of curiosity, where I can really listen to what someone else is saying and be willing to test my own assumptions without automatically believing they are absolute, I will be relaxed, agile, and strong. When I am pushed, I will absorb the shock by allowing myself to be temporarily moved, and then come back to center – my place of strength. I can integrate what others are saying, broaden my perspective, and allow myself to grow stronger as a result. From this place of strength I will engage in communication that is far more productive. Most of us will be knocked off balance periodically. We may find ourselves swaying from one direction to the other. But each time it happens, we can practice coming back to center – being willing to let go, relax, listen, and adjust accordingly. In doing so, we will learn and grow. We will transform ourselves and set powerful examples for others. And in so doing, we will truly lead. If you’re feeling a bit off balance check out the The Pinocchio Principle Unleashed: The Real Leader’s Guide to Accessing the Freedom & Flow of Your Authentic Genius, an exclusive 13-week leadership development program designed to help high achieving (and often overextended) leaders minimize pressure and stress so they can access their best work — and enjoy their lives more both on and off the job. Though the spring program has now closed, registration for the fall program will open soon. 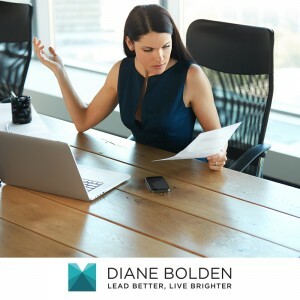 To get on the waiting list, email Support@DianeBolden.com. 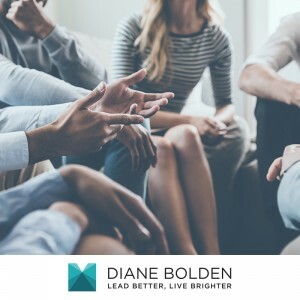 We’ve all been to a lot of classes – whether on leadership or related subjects – where we sit passively and listen to someone teach us things from a workbook or a power point presentation. Some of these classes infuse us with new ideas and inspirations, and others do not. Either way, the chief challenge is coming back to our daily work and implementing what we have learned. Class or no class, putting into practice the ideas and insights we get on a daily basis is a challenge. It is a challenge because it calls for us to integrate them into a way of doing things that we have established for ourselves over a long period of time. To change, grow or improve in any way, we must consciously look at ourselves. We need to look at both what is working and what is not. Often we are so accustomed to running from project to project and meeting to meeting, that we aren’t even aware of the dynamics at play under the surface. This frenetic approach leads to a pattern of similar results, similar experiences, and inevitably similar frustrations, and often the feeling that there has to be more to it than this. The truth is, you already possess within you the core essentials you need to be successful. The question is, are you using them? And are you using them to the best of your ability? If the answer is no, it doesn’t matter how many new tools you acquire or methodologies you learn. Our chief challenge is not to continue looking to others for solutions and answers, but instead to take the time to tap that part of ourselves that remains our purest potential. The prerequisite for being an effective leader of others is to learn to lead ourselves. The same is true for each of us. 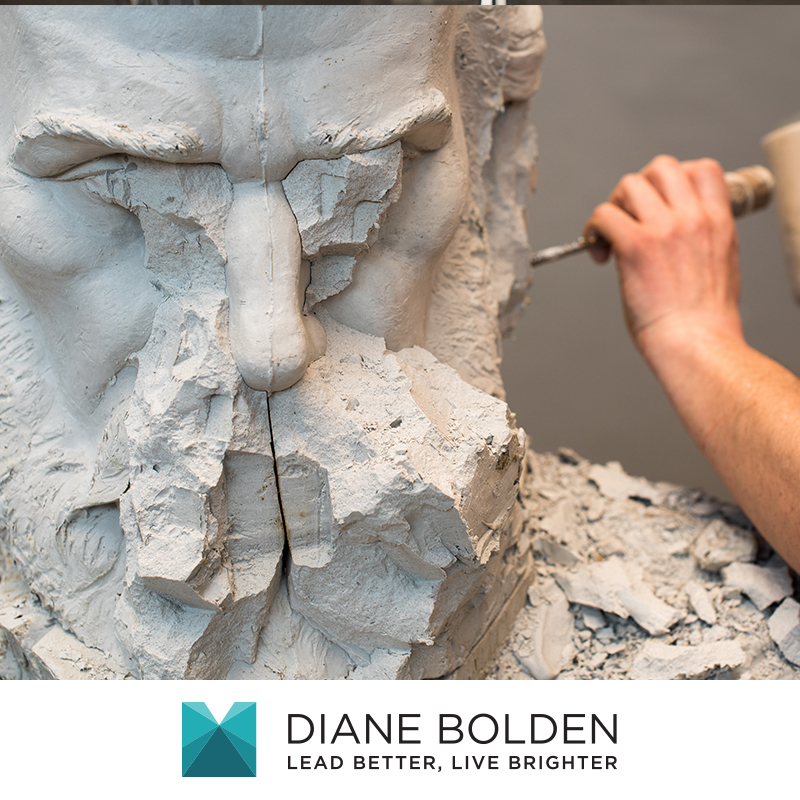 Our chief task as leaders is to chip away at the stuff that surrounds the masterpiece. What stuff? You may ask. The habits, patterns and approaches you’ve been utilizing over the years that are no longer getting you the results you want. And the inaccurate beliefs, assumptions and doubts you have about yourself, others, and what is generally possible in any given situation. These are the major factors that keep you from unearthing your best work. So how do you chip the away at the extraneous? 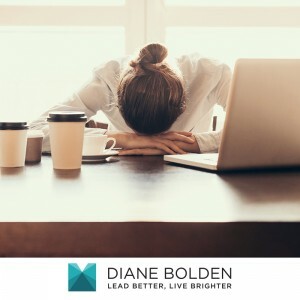 The part that is especially challenging for people is that they often don’t even realize they are operating from a mindset that isn’t serving them. They may recognize the results they’re getting aren’t what they’d like without necessarily realizing that the core issue lies within them. And the tricky thing is that until you recognize that the mindset you have isn’t serving you, you will continue to make decisions and attempt to solve problems operating within the very frame of mind that is keeping you from seeing the outcomes you want. Here are some steps you can take to shift into a way of thinking that allows you to bring out your very best – and in the process help others to do the same. The first step is to TAKE RESPONSIBILITY. The next time you have an experience that doesn’t go the way you’d like it to, replay it in your mind and try to identify the role you played in it –not only with your actions (or lack of action) but also your thoughts – what you were believing at the time, where your focus was, and how others reacted to you. Ask yourself what you would do differently next time. Then envision what that would look like and feel like if you were to have the same situation, but a more favorable response. In this way, you can allow your experiences to teach and mold you into something better – even the ones that are less than optimal. The second step is to PAY ATTENTION. You are bound to fall into old patterns again and again, but the more you become aware of them, the less compelling they become. At first you may not catch yourself until after the fact, but over time you will find you can interrupt the cycle sooner, until finally you are able to head it off at the pass and choose a different response altogether. The third step is to IDENTIFY WITH THE MASTERPIECE, NOT THE MARBLE. You are not your thoughts, your patterns or your habits. You are much bigger than that. Once you are aware of how those things are operating in your life, you free yourself up to choose new ones. Rather than chipping away at the marble, you will begin to grow from within it, busting through the constraints that no longer hold you captive. Instead of dwelling on your limitations, focus on your strengths. Instead of putting your attention on the things you don’t want to see, begin identifying with what you do want and recognize that you have the ability to achieve it. As you begin to clear the debris from your view, you will see things in a whole different light – including those around you that you have the opportunity to lead. These folks are far more likely to take their cues from your action than your words. And when you begin to help them identify with their masterpieces as you have learned to do, there is nothing you cannot achieve. If you are interested in additional strategies for inspiring and motivating yourself and others to higher levels of performance and impact – as well as greater fulfillment both on and off the job, check out The Pinocchio Principle Unleashed: The Real Leader’s Guide to Accessing the Freedom & Flow of Your Authentic Genius, an exclusive 13-week leadership development program kicking off the week of April 1st. Imagine that software you’ve relied on for years stops working for you. You notice that it has been freezing up a lot. At first, it didn’t really bother you. But now these little glitches are happening so often that you’re having trouble getting things done. When you look into the problem, you find you are not the only one that has been experiencing it. Much to your relief, a new version of the program is being rolled out that has fixed all the bugs. And happily, this updated program is now available for you to download. The same thing happens to each of us. We are cruising along doing what we’ve always done only to find it just isn’t working so well anymore. We aren’t getting the results we wanted. Or worse, what worked before is actually causing new problems. And despite our best efforts, these problems are throwing a big monkey wrench in things. So how do you find a bug in your program? First, you start by recognizing that you aren’t getting the results you want. And then you work backward. Finding the bug in your program requires that you detach from your actions in such a way that you can observe and evaluate them. One way to do this is to replay events in your mind to identify any causal factors. You can do this in the car on the way home from work as you mentally review the day’s events and evaluate what went well and what didn’t. You can journal about it. Or you can talk with someone who is an objective third party, like a friend, family member, mentor or coach. The bug in your program is almost always a knee jerk reaction. Knee jerk reactions are the product of conditioning—what happens when a behavior becomes so automatic that you no longer need to think about it. And conditioning is good when it leads you to behave in a way that is constructive—like when you practice a new skill over and over again until you can do it without having to remind yourself of each step. But conditioning that leads you to spring into action when what you really need to do is give a little more consideration to your response can get you into trouble. There is a neurobiological component to conditioning. Every time you practice something or respond to a stimulus in a certain way, you are creating neural networks in your brain. Neurons that fire together wire together. And the more they fire, the stronger and more automatic their connections (and your behaviors) get. Conversely, when a neural network is interrupted or not used for a certain period of time, these connections begin to weaken. Once you have identified the bug, you can begin to eliminate it. Simply being aware of a knee jerk reaction will begin to loosen its grip on you. This is not to say that someone could instantaneously eradicate a bug and immediately improve his or her results. It takes time. Awareness is half the battle. Initially, errors are not caught until after the fact, but with increased awareness and attention, you can notice them sooner and sooner. The time it takes to realize blunders drops from hours to minutes, and, with continued diligence, you’re able to take steps to correct them in real time. Ultimately, you can get to the point where you can prevent yourself from engaging in this automatic reaction altogether. As the bug is eliminated, the program can be upgraded. Upgrading the program is a matter of replacing an old behavior with a new one. Unlike software upgrades, this one doesn’t isn’t a matter of a simple download. It requires attention, thought and persistence. As mentioned previously, neural networks that correspond to old, undesirable patterns of behavior weaken when they are not engaged. And as they weaken, repeated practice allows new neural nets to be formed that support a more desirable behavior. But doesn’t creating new neural networks require a huge amount of practice? The interesting thing about the formation of these neural networks is that they do not have to happen in real time. Research has shown that mentally rehearsing a new pattern of behavior leads to the same growth in neural networks that physical practice does. Really. If you replay the situation you wish you could have handled differently and “edit” your action to the desirable choice, you are literally rewiring your brain to act the correct way in the future. Doing so will allow you to create and increasingly rely on new neural networks when in situations that necessitated different responses. Gradually, you are able to replace your tendency to demand compliance with a more thoughtful, respectful, and engaging approach to influencing others. Step One: Find your bug. The first step is to recognize when you have a tendency to engage in behavior that keeps you from getting the results you desire. Most likely this will be a knee jerk reaction that propels you into action before you have a chance to think. Step Two: Disempower your bug. Becoming aware of behavior you fall into and the impact it has on your effectiveness ultimately weakens its hold on you because while it still may be automatic, it is no longer unconscious. Though falling into old patterns when you know better is frustrating, this awareness is a sign of tremendous progress. Step Three: Substitute a new program for the old one. As your old habits and the corresponding neural nets that lead you to engage in them begin to weaken, you can replace them with new behaviors. The more you practice these new behaviors (whether physically or mentally), the stronger the new neural networks and your new patterns will become. And the less you engage the old behaviors, the weaker and less prominent the old neural networks (and the corresponding behaviors) get. If you find yourself engaging in behavior that is interfering with your effectiveness, the most important thing to remember is that you are not the program that is running it. You are the programmer. You have the ability to consciously choose the behaviors and the responses you have to any given stimulus. Though interrupting and upgrading your internal programming takes time, the results will be well worth your effort. And the best part is that you don’t have to lodge a complaint with or rely on anyone but yourself in order to do it. Now if only we could keep those darn devices from freezing up! 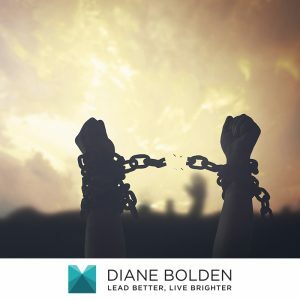 If you are interested in additional strategies for upgrading your internal programming so that you can access your very best performance, I encourage you to check out The Pinocchio Principle Unleashed: The Real Leader’s Guide to Accessing the Freedom & Flow of Your Authentic Genius an exclusive 13-week leadership development program kicking off the week of April 1st. Have you ever had a really hard time getting something done? Something big? When you are up against a large task or project, it’s easy to become overwhelmed by the details and the magnitude of what is before you. Sometimes it hard to know where to start, and once you do it can feel like a never-ending process. 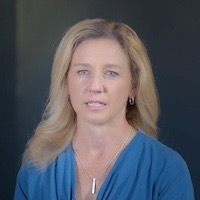 To make matters worse, when the project you are working on necessitates that you do something new—something uncomfortable and challenging—it often elicits fear, frustration, and anxiety. All of these things can keep you feeling stuck. In a state of overwhelm, the focus goes from the joy of getting something done to the aggravation of having something undone. We can become mechanized in our attempts to figure out what needs to get done and exactly how to go about it. We may also put a lot of pressure on ourselves and beat ourselves up for things we haven’t done, rather than recognizing and acknowledging ourselves for what we have done. In what is often an unconscious attempt to regain a sense of control, we are easily lulled into doing things that we know will be easier and potentially more enjoyable. Some tasks don’t really need to get done right now (or ever) or should really be delegated to others, but we often prefer those. Some of the time-wasters we get sucked into include surfing the web, making idle conversation, cleaning out your inbox, or—my personal favorite—making more lists of everything we think needs to get done and identifying all the steps we need to take. This is actually a great thing to do when you’re focused, but, in a procrastination mode, it becomes to planning to plan—and then plan some more—until you have a rock solid strategy that you never actually execute. It may feel like you are spinning your wheels—running like hell and just not getting anywhere. I know this, of course, because I have been there. Repeatedly. And I’ve worked with others who fall into this pattern, as well, to stop the madness by recognizing what’s happening and making a shift to get back on a road that leads them where they need to go. 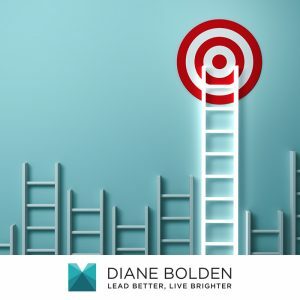 One of the most powerful things I have found for breaking out of a “spinning your wheels” cycle is to take some time to revisit your purpose—or the larger mission or goal behind what you are doing. Get clear about what­—or who—the work is for. Identify how it will improve the quality of life for yourself or those around you. Reflect on the degree to which it will help people, contribute to something greater, or allow you to achieve a meaningful goal for yourself. This doesn’t have to take hours and hours. Just pause for a few moments and ask, when this project/task/ initiative is finished, what larger goal or purpose will it accomplish? What would you like to accomplish? Write it down. Add to it as you think of additional bonuses. Then, sit for a moment and see if you can envision what it would feel like to satisfy that larger purpose, vision or goal. See if you can feel it so clearly that you are actually grateful for it. This simple act will help you reconnect with something inside you that will propel you beyond the minutia. It will give you the courage and strength to walk through your fear or resistance to do something that you may not be so good at yet. And it will help you to get back to the joy that comes through the process as well as the attainment of the end goal. When you approach things in this manner, all that you do will be instilled with a new energy—one that uplifts, delights, and inspires. Whatever you experience as you work on a project will be the same thing people will feel when they partake of the fruit of your efforts. The more we remember this, the more we will experience the satisfaction and gratification of having done something truly meaningful—something that lifts us out of the humdrum and into a place of brilliance. And all who come into contact with our work will be better off because of it. Interested in additional strategies and practices for getting out of overwhelm so you can have more traction, make a greater impact, and infuse more life and meaning into your work? Check out The Pinocchio Principle Unleashed: The Real Leader’s Guide to Unleashing the Freedom & Flow of Your Authentic Genius. Do you find yourself running from one thing to the next with little time to really think about what you are doing and why? Many high achieving professionals feel as though they have way more to do than they have time to do it. Their ambition, drive and passion have served them well, and gotten them to a nice place, but still they know they are capable of more. More visibility, more opportunity, more income, and dare I say – more freedom to enjoy their careers and their lives. The daily grind has a way of keeping us tethered to the ground, feeling as though our best is just around the corner, if only we can get through what’s in front of us, which is often an accumulation of projects, events and other commitments that ends up growing far faster than it shrinks. Every once in a while, it becomes apparent that something’s got to give. But who has time to slow down when there is so much more to get done? The fantasy many of us have bought into is that if we just work longer and harder, we will get there. 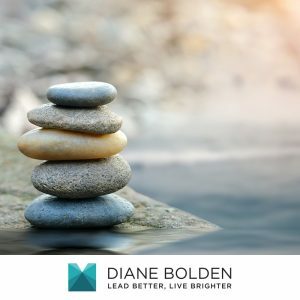 And despite our longing to find balance and the sweet spot that will finally allow us to relax and be more effective, we often act in ways that bring greater levels of anxiety and toil. As leaders, we also unwittingly create entire cultures of people who emulate our frenetic behavior in the name of getting ahead. 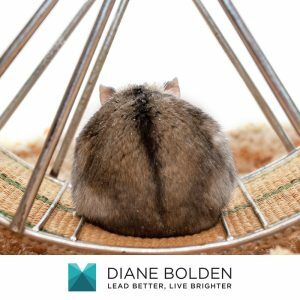 The hamster in the wheel doesn’t realize he isn’t getting anywhere. And before he can, he must realize that he is, in fact, in a wheel. Our wheels are much more sophisticated and deceiving than those of the hamster. Because initially, our wheels do get us somewhere. It’s just that over time, they lose traction and become stuck in comfortable ruts. And we don’t realize when we’re stuck, because it doesn’t seem possible to be standing still when you are running like hell. Are you ready to stop the madness and take things up a notch? Can you conceive of finding a better way to do things? How badly do you want it? Bad enough to try something that goes against every compulsion you currently have to keep doing what you’ve been doing all along? Consider the prerequisite for successful change. Have you ever noticed that when you upgrade software, the program often needs to uninstall or extract something before it can successfully run? Gardeners know that new blossoms proliferate when the old flowers and branches have been pruned. Bargain shoppers know that stores sell older merchandise at a significant discount to get it off the shelves to make room for what’s coming in the new season. What tried and true ways of doing things have lost their leverage? Pay attention to the times during the day that you feel the most anxious, stressed, or tense. Recognize the pattern of thought or behavior you are engaging in that may be causing this discomfort. This may be a prime area for you to make a shift. Notice what catches your attention in the coming days. The answers to your questions will reveal themselves to you, but you must open yourself up to them and be willing to listen. Once you begin to notice that the patterns and triggers that create the highest degree of anxiety, stress and pressure – and the impact they are having in your life, they begin to lose their hold on you. When you open yourself to new ways of doing things, you move from a point of view to a higher viewing point – one that allows you to see solutions that may have previously evaded you. Allowing yourself to envision and believe in a new way of doing things will transform your frustration into fuel and help you summon the courage you need to overcome obstacles along the way. If you are interested in specific strategies for breaking through old habits and patterns that no longer serve you so that you can create more freedom and flow in your work and your life, check out The Pinocchio Principle Unleashed: The Real Leader’s Guide to Unleashing the Freedom & Flow of Your Authentic Genius that is coming soon! Registration will be limited to 25 people, and I’m in the process of hand selecting participants. If you would like to schedule a complimentary consultation call to see if you (and/or others from your organization) are a good fit, contact support@DianeBolden.com. Winston Churchill once said, “Success is not final and failure is not fatal – it is the courage to continue that counts.” Thomas Edison said, “Many of life’s failures are people who did not realize how close they were to success when they gave up.” These words of wisdom lead me to ponder even the definitions of the words “success” and “failure“. Perhaps they are nothing more than labels we use for experiences that could very well be integral stepping stones for the people having them. Both words are laden with judgment, leading us to want to move toward one and away from the other. But what if they are simply two sides of the same coin? It has been said that Abraham Lincoln failed in business twice, had a nervous breakdown and was defeated in eight elections. Walt Disney was fired by the editor of a newspaper who felt he lacked creative ideas. As a boy, Thomas Edison was told by his teacher that he was too stupid to learn anything. Soichiro Honda, the founder of Honda, was turned down for an engineering job by Toyota. Before becoming a successful actor, John Wayne was rejected from the United States Naval Academy. Steven Spielberg unsuccessfully applied to film school three separate times. Baseball legend Babe Ruth struck out 1,330 times. The first novel of best-selling novelist John Grisham was rejected by sixteen agents and twelve publishing houses. Robert M. Pirsig’s book Zen and the Art of Motorcycle Maintenance was rejected by 121 publishers before it was published in 1974 and went on to sell millions of copies in 27 languages. This list could go on and on. What each of these people have in common is that they didn’t let labels like “success” or “failure” define who they are. They didn’t allow the events in their lives (or their thoughts and judgments about them) to get in the way of their dreams or their beliefs in what they were capable of – and what was possible. And their courage, perseverance and determination benefitted not just themselves, but countless others – many of whom came generations later. 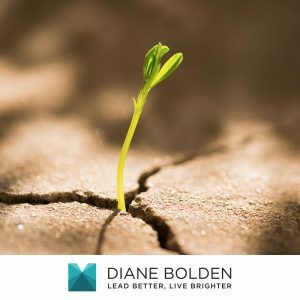 I came across another great quote by a woman named Susan Taylor who said, “Seeds of faith are always within us; sometimes it takes a crisis to nourish and encourage their growth.” If this is true, perhaps what some call “failure” is actually a catalyst – or even a prerequisite – for what others call “success”. What is going on in your life right now? What if it is exactly what you need to experience in order to get where you most want to go?